I like playing along with other photographers/bloggers on the photo challenges that go on regularly. One of my challenges is with Where Is My Backpack. This latest challenge is Oceans. So here is a photo that you may have seen before, Bird, Beach & Clouds, which was taken on the coast of Oregon and features Haystack Rock. This entry was posted in Challenges, Where's My Backpack Challenge and tagged beach, bird, clouds, coast, Found Round and about, Haystack Rock, nature, OR, photography, tisha clinkenbeard photography, travel theme challenge. Bookmark the permalink. Strelitzia Reginae: Birds Of Paradise. You’ve really caught the scenic wilderness of that beach. 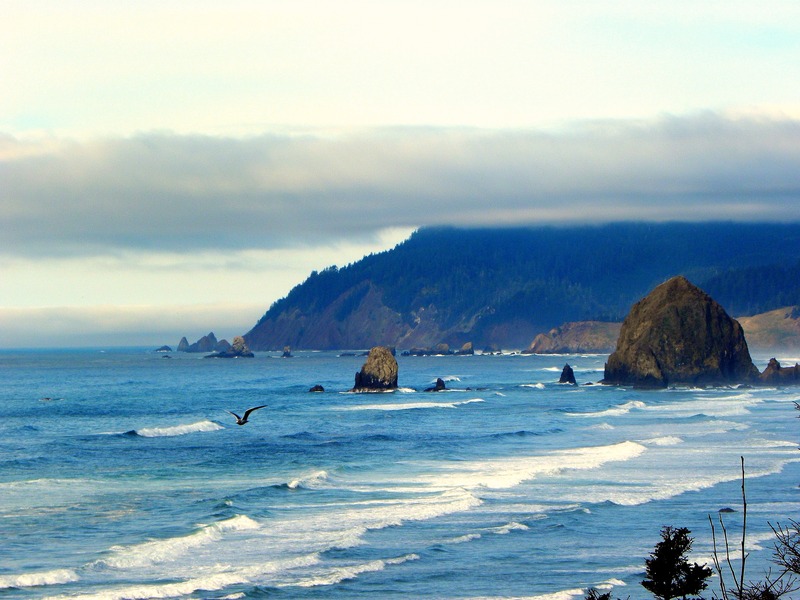 Lovely, Tisha, the Oregon coast is spectacular and you’ve captured some of its wild beauty in your photo, really beautiful blues! Thank you! The beach was gorgeous and showed how different a beach can be from the typical sunny & hot. Wow – so much to see in this shot! !